Thoth is the Egyptian god of writing, balance, wisdom, equilibrium, magic, and the moon. In Egyptian his name is Djehuty which translates to "He who is like the Ibis". The ibis is a sacred bird of ancient Egypt that was often kept as a pet and is associated with wisdom. 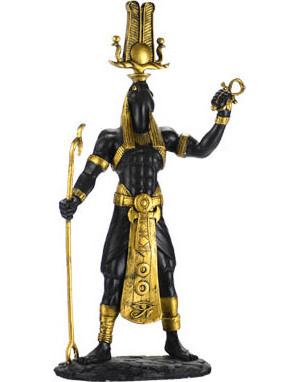 This is a hand painted black statue with golden accents measuring 12 and 1/2 inches by 5 inches, by 3 inches.